Eastwood puts on the original poncho again! 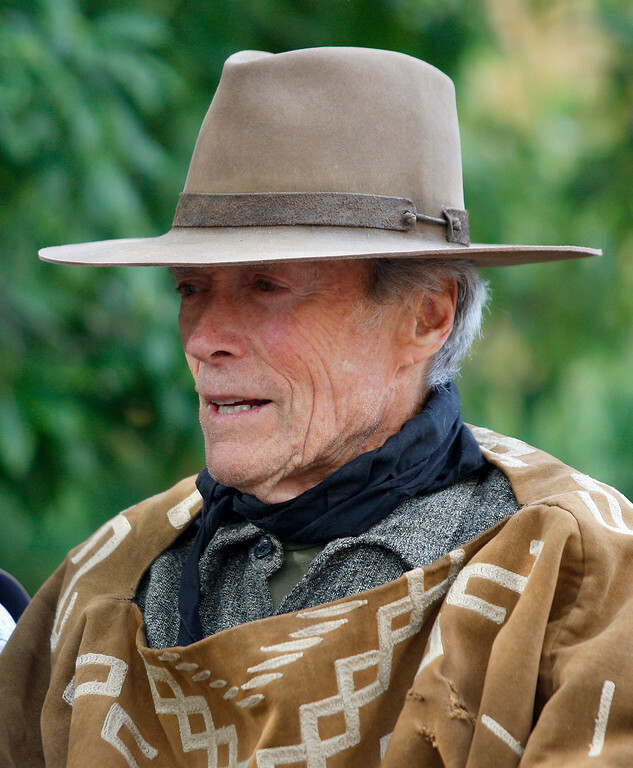 Re: Eastwood puts on the original poncho again! There is a thread http://www.fistful-of-leone.com/forums/index.php?topic=2360.0 that shows some stills from For a Few Dollars More and GBU where someone forgot that the sewn-up bullet holes from Fistful were in view; typically, the poncho was rotated for a scene so they wouldn't be visible, but sometimes someone forgot. Even in Fistful - since shot out of sequence like most films - has a few instances of this. Look in this photo: sewn up bullet holes are visible. I just saw a similar pattern to the pancho in the film Juarez at about 46 minutes in, looks like it was on a blanket of some sort it's the scene where Juarez learns of Abraham Lincoln's death. I may have to rewatch the whole thing again see if I see more. this pattern seems to be pretty common. And I believe a garment with the same pattern was used in Leone's first movie, The Colossus of Rhodes. In AFOD & AFDM it was green and probably faded to brown and in GBU Clint wore it brown outward, and it still retained it's green color on the underside and also seen brown/green on display years later. You're right SadHill, you're right.